Sara Williams further cemented her status as an icon of British rallying as she won the 2015 Red Dragon Rally outright by 1 minute 21 seconds. Sara and her co-driver, Patrick Walsh, navigated 36 stage miles in less than ideal conditions, coming out on top after a faultless day of driving and teamwork. This success marks Sara’s third win overall in a rally event, after she famously became the first female driver to win a rally outright for 30 years in 2013. In addition, Sara and Patrick won the Nick Bradbury Award for fastest final stage time - capping a perfect weekend for the team. The Red Dragon Rally is organised by Port Talbot Motor Club (which is celebrating its 50th anniversary this year) with rally headquarters being situated at the Walters Arena Complex in Neath, near Swansea. The Red Dragon 2015 constituted 5 stages, 2 separate courses were combined to create a demanding test of gravel surfaces through the famous Welsh forests. The 20th June 2015 was a typically damp Welsh Saturday - the stages slippery and the drivers raring to test themselves. Sara and Patrick would be the first car on stage for the 10:30am kick off, with only two course cars preceding their initial run. It was a particularly special day for driver and co-driver alike, as Patrick had been in the car with Sara for her very first forest event in 2009. As Sara roared her V-Ex Virtual Exhibitions sponsored Subaru Impreza off the start line, the rally began in earnest. Stage 1 posed a number of problems for Sara, as running first in the order pitted her and Patrick against more loose gravel and as a result, less grip. Despite contending with less favourable driving conditions than other competitors, Sara and Patrick posted the second fastest stage time, only a second behind the leader heading into stage 2. Sara and Patrick kept the pressure up during the day’s second stage, posting the joint fastest time at the end of the run which kept Team Brecon Motors secure in second place overall, still a second behind the race leader. What followed was a brief service by the Geoff Jones Motorsport (GJM) crew and a team regroup as Patrick and Sara caught their breath for the climax of the event. Stage 3 was a re-run of Stage 1, with most of the morning’s loose gravel gone and a clearer line available to the drivers. Capitalising on the improvement in conditions, Sara and Patrick set the fastest time, posting an 8.06, a full six seconds improvement on their earlier run. Sara and Patrick finished the section first overall with a 2 second advantage heading into Stage 4. With increasing grip, confidence and the Subaru running faultlessly; Sara attacked the remaining stages, her expertise on gravel again shining through. As with Stage 3, Stage 4 was also a re-run of a morning course: Stage 2. With a very fine margin to uphold, Sara and Patrick needed to make the most of a worn-in stage, and did so in spectacular style. Sara and Patrick posted a 5.28, an astonishing 17 seconds faster than their nearest competitor, greatly extending their lead. However, conditions for Stage 5 sharply deteriorated. The heavens opened, and for the days final and longest stage the drivers had to contend with an incredibly slippery surface. The stage was the rally’s two different courses combined – presenting a much larger challenge to the drivers. Margin for error is particularly fine on longer stages, as minor mistakes early on can translate to huge time losses at the finishing post. With the weather against them on the day’s toughest driving challenge, Sara and Patrick excelled. 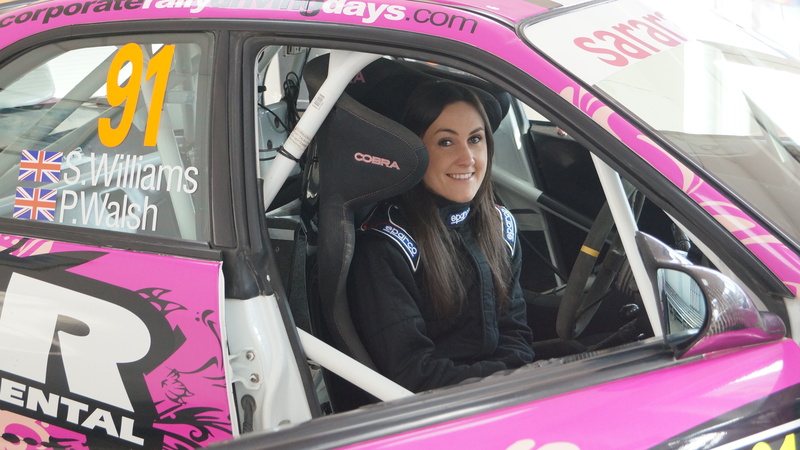 Sara posted a fastest stage time of 14.31, a whole 30 seconds ahead of the nearest car. As a result, Sara and Patrick had triumphed in emphatic style. Furthermore, the pair scooped the Nick Bradbury Award for setting the fastest time on the final stage of the day, making it a day of double honours for the Welsh duo. 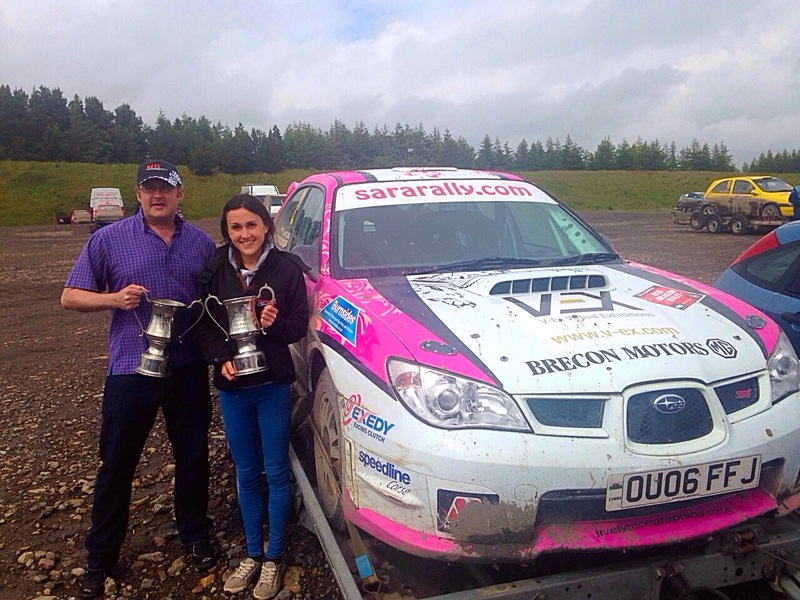 With another victory under her belt, Sara is seeing her dedication to rallying pay off. After a gruelling WRC rally debut in November and a hectic 2015 schedule for the Welsh rally star, Williams has again proved she has the hunger and the skill to reach the highest echelon of rallying. As an accomplished driver in the British rally scene, victories such as these again highlight the immense progress she has made since she first entered the Welsh forests with Patrick in 2009. Through consistent and brave driving, Sara is achieving the multiple accolades her and her team’s hard work deserves, something that every motorsport fan loves to see.